It is hard to argue that the Strip is the most visited location in Las Vegas. With all the nightclubs and craziness going on 24 hours a day, it is easy to see why so many take fancy to it. Yet, there are some downsides to spending your vacation on the Strip. Often times, you will hear many people who dislike the Strip refer to the lack of culture, the expense of everything from food, drinks and entertainments and the overall touristy vibe that surrounds you. Fortunately, there is an alternative to the Strip. Referred to as “Old Las Vegas,” downtown does have all the excitement of the Strip but the local feel and prices. Downtown Las Vegas has been revamped into a local hotspot that is visited by thousands every day and night. 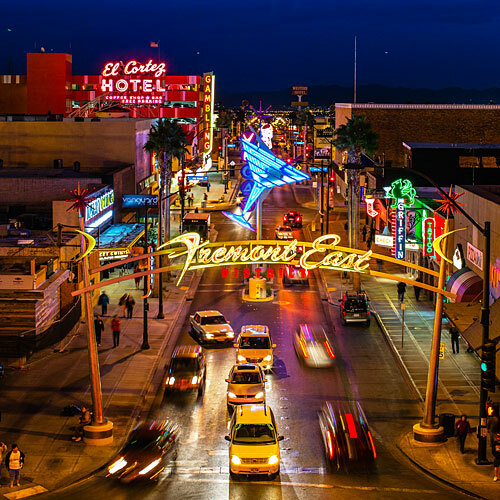 If you enjoy people watching and the sidewalk performances, you will be able to see all that on the Fremont Street Experience. Over the last couple of years, Downtown Las Vegas has made a big push to growing and improving the image of the area, hosting festivals such as Life is Beautiful and many free concerts by big-name talents. While the restaurants on the Strip are top notch, they are not that wallet friendly. Downtown Las Vegas has exceptional eateries of all styles that won’t hurt your wallet. Whether you are looking for a nice steak dinner at Andiamo, authentic Mexican food at La Comida or a blend of different styles as you would get at Chow, Downtown Las Vegas is the perfect place to go for all you foodies. Beer, wine or cocktails, Downtown Las Vegas has it all. With many different bars in the area, you will find a place that exceeds all expectations. Take a tour of the Bangor Brewery in the heart of downtown, enjoy a nice glass of vino at Bin702 or visit a Las Vegas landmark at Atomic Liquor and try out some of their specialty cocktails that will blow you away. As with the case of the Strip, you will not have to take out a loan to enjoy some nice drinks with your friends. Downtown Las Vegas is the hotspot of entertainment. Zipline over the Fremont Street Experience and wave to all the people below as you zoom over their heads. Enjoy free concerts playing in front of The D Hotel or stop into one of the many casinos to try your luck at the tables of machines. Travel Downtown in style with a tour from Vegas Pub Crawler. Hit all the hotspots and pubs that DTLV has to offer. Vegas Pub Crawler is the ultimate way to bar hop in Downtown Las Vegas. Whether it is a birthday party, bachelor/bachelorette party, corporate event, wedding party or a date night on the town, there is nothing quite like pub crawling via a pimped-out, multi-rider cycle. For more information on how you can book your DTLV pub crawl, visit our website.